Have you ever been with a married couple that argues with each other while you’re with them? As the arguing progresses, how do you feel? Awkward? Embarrassed? Closed in? Uncomfortable? Yes …we feel that way too. 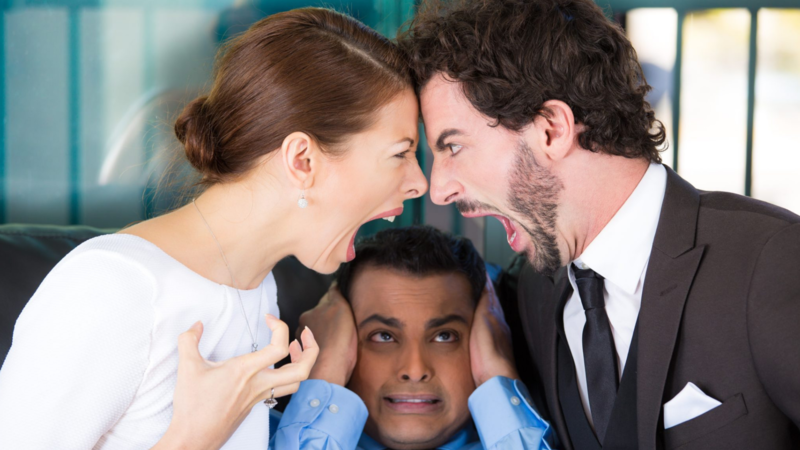 We know many others who feel that same awkwardness about spouses arguing in front of them. It is like these arguing couples have blinders on that erase anyone else who is around them. They just argue away, no matter who’s there. If children, other family members, friends, or even if strangers are with them, they still argue. It’s as if no one else matters. That’s because it becomes all about what concerns THEM at that present moment! We talked with a couple whose adult “child” and spouse often put them in this situation. This young couple thinks nothing of breaking out into full-blown arguments with each other when their parents are with them. The parents have expressed to them their feelings of awkwardness and embarrassment. They’ve asked them to take their disagreements into private places. And yet nothing has changed. This young couple is convinced that it’s “healthy” to air out their differences like this. For this reason, they continue to expose their parents and others to their arguing tirades. But it isn’t healthy or mature to do this. And it isn’t considerate to the others in the room when spouses can’t settle their differences privately. My dad and step mom sometimes put us in this place. Several times we were in the car with them on long trips when they would argue. We felt like we were trapped in a cage—and essentially we were. We were VERY uncomfortable the whole time. I even joked with them one time saying, “Don’t let me come up there and break you two apart.” And yet they didn’t skip a beat. They just kept fighting as if we weren’t even there. It was bad enough when they did this in our home or theirs. But it was even worse to be trapped in a car with them when we couldn’t walk away. We finally made the rule that we wouldn’t ride in a car with the both of them. They didn’t like it; but we didn’t care. It was better for us to drive separately in a peaceful vehicle than to allow them to expose us to that type of toxic behavior. We’re wondering… how are we looking out for the “interests of others” when we expose them to our arguments? It’s just plain rude to put them in the middle of this situation. That’s why we’re encouraging you to be kind. Take your arguments with each other elsewhere. We can’t say it any plainer than this. Be considerate. Please don’t subject others to your fights. Look beyond your angry situation and S.T.O.P. = See The Other People who are around you. Go elsewhere to settle your disagreements. We’re told in the Bible, “There is a time for everything, and a season for every activity under heaven.“ And this includes a time to openly conflict with each other as husband and wife. It also includes a time when it’s best to NOT openly disagree with each other. So, not only do OTHER people NOT want to be part of your arguments with each other, you shouldn’t expose your spouse to this invasion of privacy. It shows that you aren’t valuing your spouse as a marriage partner. Even if he or she is the one who initiates the argument in front of others, do what you can to get out of it. • A parent will more likely remember the issue long after a couple has forgotten. • The respect and perception once held by a parent for a child’s spouse will decline. • A couple may feel uncomfortable facing the parent even after an incident has been resolved. • A parent’s natural reaction is to protect a child and this reaction may cause further damage to the relationship. It is important that the fight take place between those directly involved and that neither party elicits the help of friends or family members to validate their position. It doesn’t matter how many other people agree with you, that doesn’t necessarily make you right, so don’t involve others in your fight. The exception to this rule is when you are seeing a counselor or mentor(s) who are trying to help you with your issues. But this is an arranged time together; so it’s different. Sometimes a third party can be more objective. As a result, they can offer you good counsel or advice on how to work through your disagreements in a healthier way. But make sure the counselor isn’t someone who is more partial towards one spouse above the other. In Proverbs 18:2 we’re told, “A fool finds no pleasure in understanding but delights in airing his own opinions.” And Titus 3:2 it is stated, “Remind the people to slander no one, to be peaceable and considerate, and to show true humility toward all men.” These are good guidelines for us all! In closing, we remind you to look beyond your angry situation. S.T.O.P Arguing … See The Other People who are around you when you and your spouse are arguing. Be considerate of them, AND each other. It’s important to go elsewhere to settle your tense disagreements. Ultimately, this will benefit ALL who are concerned.